In recent years, the field of academic publishing has ballooned to an estimated 30,000 peer-reviewed journals churning out some 2 million articles per year. While this growth has led to more scientific scholarship, critics argue that it has also spurred increasing numbers of low-quality "predatory publishers" who spam researchers with weekly "calls for papers" and charge steep fees for articles that they often don't even read before accepting. Ten years ago, a few students at MIT's Computer Science and Artificial Intelligence Lab (CSAIL) had noticed such unscrupulous practices, and set out to have some mischievous fun with it. Jeremy Stribling MS '05 PhD '09, Dan Aguayo '01 MEng '02 and Max Krohn PhD '08 spent a week or two between class projects to develop "SCIgen," a program that randomly generates nonsensical computer-science papers, complete with realistic-looking graphs, figures, and citations. SCIgen emerged out of Krohn's previous work as co-founder of the online study guide SparkNotes, which included a generator of high-school essays that was based on "context-free grammar." SCIgen works like an academic "Mad Libs" of sorts, arbitrarily slotting in computer-science buzzwords like "distributed hash tables" and "Byzantine fault tolerance." The program was crude, but it did the trick: In April of 2005 the team's submission, "Rooter: A Methodology for the Typical Unification of Access Points and Redundancy," was accepted as a non-reviewed paper to the World Multiconference on Systemics, Cybernetics and Informatics (WMSCI), a conference that Krohn says is known for "being spammy and having loose standards." In the wake of the international media attention, WMSCI withdrew the team's invitation to attend. Not to be deterred, the students raised $2,500 to travel to Orlando, Florida, where they rented out a room inside the conference space to hold their own "session" of randomly-generated talks, outfitted with fake names, fake business cards, and fake moustaches. 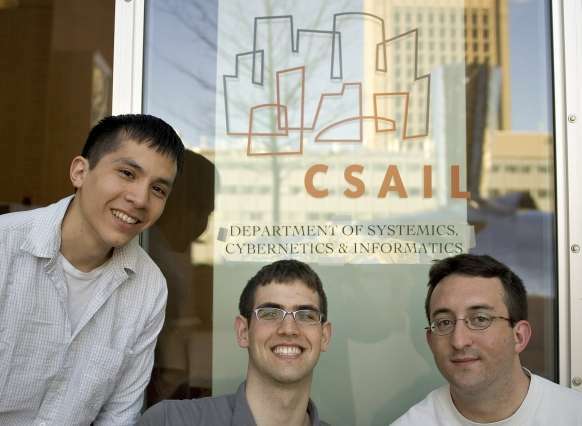 The trio of CSAIL alumni have since moved on to other things: Aguayo is a technical lead at Meraki; Krohn, who co-founded both SparkNotes and the dating site OKCupid, now runs Keybase, a startup aimed at making cryptography more accessible; and Stribling had stints at IBM, Google, and Nicira before joining Krohn's team at Keybase this month. But even a decade later, the team's creation improbably lives on. Stribling says the generator still gets 600,000 annual pageviews that manage to crash their CSAIL research site every few months. The creators continue to get regular emails from computer science students proudly linking to papers they've snuck into conferences, as well as notes from researchers urging them to make versions for other disciplines. "Our initial intention was simply to get back at these people who were spamming us and to maybe make people more cognizant of these practices," says Stribling, before deadpanning: "We accomplished our goal way better than we expected to." For the 10-year anniversary, the team reconvened for a project that's once again aimed at predatory publishers. "SCIpher" lets you hide secret messages inside randomly-generated calls for papers (CFPs) that appear to be coming from (fictional) conferences with names like "the LYGNY Symposium on relational, software-defined technology." Entering a secret message into SCIpher create text for a ready-to-send CFP that the CFP's recipient can throw back into the generator to recover the original message. Stribling says he views SCIpher as a cheeky way to trade secrets—not to mention, to poke fun at conferences' ridiculous, jargon-filled names. "We combined almost-pronounceable acronyms with random buzzwords cribbed from the SCIgen grammar to evoke the kind of niche specialization that results from thousands of concurrent conferences clamoring for authors," says Stribling. "Plus, while an encrypted email would be a big red flag for some investigators, in our experience when you send out a call for papers, it's very unlikely that anyone will read it." Perhaps it's my thesis writing induced insanity talking but, "Obviously our data is preliminary" just started a laughing fit that was continually refreshed as they just kept on presenting their bogus data! It's impressive that their program which they made so quickly could produce those articles or presentations! It's impressive that their program which they made so quickly could produce those articles or presentations! has been around for almost 20 years. The graphs/data collections are a neat addition, though. Guess you would need a cult of sciencology for something like this to work. The papers in the Global Warming literature comes to mind when reading about this stunt. AGW Cult "scientists" are laughing at these amateurs. Well as a consolation I must submit that most scientific papers written by live people do not make any sense either. I am waiting for app to spot general nonsense. MIT students submitted fake papers. An MIT professor laughed about lying to promote Obama care. Maybe MIT has an integrity issue. I don't know how this program would compare with some of the crackpot theories I read in comment sections, but I bet it's way better. I think it's all a conspiracy, how about you?